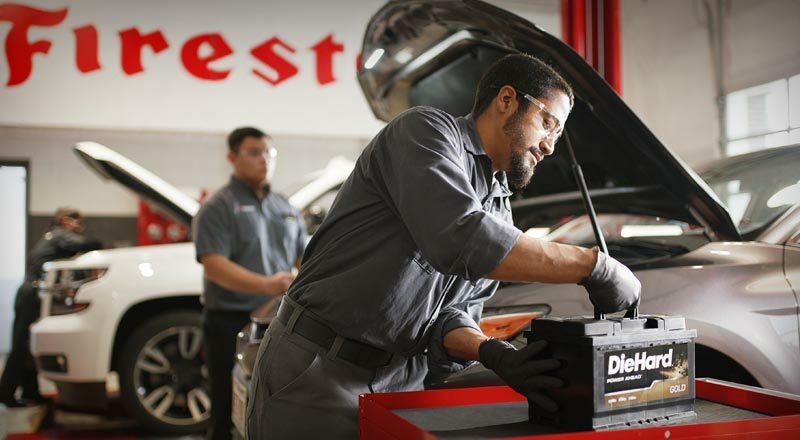 Buy car batteries in Barboursville at a Firestone Complete Auto Care near you. Make an appointment online to have your current car battery tested or get a new Interstate battery installed today! Don't wait until the dreaded "click" to get a new car or truck battery! Without a healthy car battery, your vehicle is almost as good as dead. In Barboursville, Firestone Complete Auto Care is the right auto care center for battery replacement, service, and testing. Whether you're dealing with an engine that's hard to start or new check engine light, it's time to give your battery some TLC. A swollen, bloated case, low fluid, or a leak are also clues pointing towards a battery that's on its way out. With the help of our technicians, you can drive off with the right battery at the right price—before you're stuck with a car that won't start. Stop by Firestone Complete Auto Care and get a complimentary battery check in Barboursville. We'll let you know exactly how much life is left in your battery, as well as the temperature it may fail. Our technicians will work alongside you to help you choose the best car battery for your budget, climate, and vehicle type. We install more than 800,000 batteries a year using Interstate Batteries—America's #1 replacement battery. They've proven themselves in the industry consistently for over 50 years, and that's experience we can trust. From test to installation, our services help ensure that your car or truck runs strong, no matter the season. A reliable car needs reliable parts. Your automotive battery may give your car the power it needs to get started and stay running, but other parts are important too. There's your engine, tires, brakes, steering and suspension, alignment, filters, and more! Firestone Complete Auto Care in Barboursville is the right place for it all! We deliver total car care, from your oil filter to your exhaust pipe! So whether it's time to wave your old battery goodbye, you're in the market for Bridgestone tires, or you need brake pads replaced before work, reserve an appointment online and come to Firestone Complete Auto Care. Our technicians are prepared to find the right solution for your vehicle! From state inspections to engine tune-ups to engine repair, head to a Firestone Complete Auto Care near you for your auto service needs. We're your all-in-one tire store, car care center, and automotive shop. Our automotive technicians care about keeping your vehicle running newer, longer. Bring your truck or car to us for maintenance and we’ll strive to offer unparalleled auto services. Experience the difference and book an appointment online for auto service in Barboursville, West Virginia today.